I might miss some classes this term. Every year in the summer term our students (and their parents) tell me that they may have to miss several classes this term. It’s not because it’s summer and they’re going on an exciting holiday with their family. It’s because it’s exam season. Students (and/or their parents) are worried about failing their exams and think that they need to spend as much time as possible studying and revising – especially the dreaded Night Before An Exam. It’s great that our students are committed to doing well in their exams. (When I was that age I didn’t care about the exam grades I achieved. What was important to me was studying circus skills!) However I’ve noticed that many students don’t study effectively and end up sacrificing their circus classes unnecessarily and possibly even to their detriment. Most students feel like they should (or need to) revise – or worse, do their actual studying – the Night Before An Exam. They think that last minute cramming is going to help them perform better in the exam and achieve better results. The forward roll is a fundamental gymnastic skill and is the first skill that teaches forward rotation. Knowing how to do forward rolls correctly will lead to being able to perform handstand forward rolls, dive rolls and ultimately to somersaults. As with anything acrobatic in nature, we recommend that you only practice under the guidance or supervision of a trained professional as although a forward roll may be a “simple” skill it can still be hazardous, especially if performed incorrectly. However, kids will be kids (and parents will be parents) and we know that kids will inevitably practice at home, sometimes without supervision – or at their parents encouragement (and occasionally insistence) – and in a less than ideal environment. So what can you do to prevent them from hurting themselves? The best solution would be to take them to a circus or gymnastic class where they can learn how to do forward rolls, with a trained coach, in a safe environment. But if they insist on practising at home, here are some ways that you can minimize the risk. First, clear the area and pad the floor. Use yoga mats, blankets, cushions or anything else soft. You can pick up interlocking play mats for a few pounds on online or at places like the Early Learning Centre or at some larger supermarkets. Landing with a thump on a hard floor hurts. Do whatever you can to prevent it. If your child is young or a beginner, it is a good idea to have them forward roll down a slope. The incline encourages the forward roll and helps them get their feet over their head by raising the feet in relation to their hands as they begin their forward roll. It also helps the finishing position as it is easier to stand up. The video below shows how to do forward rolls with good technique. Start standing up straight, arms up by your ears, feet together. Squat down, reaching your arms forward and placing your hands on the floor, shoulder width apart and slightly ahead of you. You shouldn’t jump onto your hands. Tuck the head in and round the back. This is critical in ensuring the safety of the head and neck. The head shouldn’t touch the floor. At best, putting your head on the floor will give you a headache. Tucking the head in and rounding the back gives a smooth forward roll. If you keep a flat back you’ll bounce and thump along the floor like rolling dice. Note for Parents: you can carefully help guide the head into a good position by placing your hand on the back of their neck but do not push or force the head as you can hurt the neck. Push on your feet, sending your hips over your head and let yourself roll along the floor in a tucked position. Reach forward as you come out of the roll, keeping tucked with your feet and knees together to allow the momentum of your roll to bring you onto your feet. Stand up with your arms stretched up to your ears in your starting position. Although forward rolls are one of first moves that students are taught, they are by no means simple. There’s a lot to think about – especially for a beginner – and a lot that can (and does) go wrong. In our youth circus classes we use lots of exercises and drills to teach each part of the forward roll. Breaking down the skill into its component parts and then piecing them together makes it much easier for students to learn. Again, we don’t recommend that you practice forward rolls at home but if you’re going to anyway, please be safe. Find out more about our youth circus classes. Following on from my post last week about how to practice juggling without getting frustrated, I thought it would be nice to share with you another juggling practice method that can be used to keep your practice interesting and entertaining. What follows is a guest post by juggler, Jon Udry, about the juggling pyramid system and was originally published on the Circus Geeks website. For those of you who don’t know him, Jon is a fantastic juggler who performs all over the world. He was the first person to win Young Juggler of the Year in 2006 at 16 years old (you do the math) winning over 50% of the votes (but he feels a bit vile talking about it these days). Jon is a Circus Geek and began writing his own blog recently too. Now that my Pyramid is designed, I would now have to execute it. Starting at the bottom and working my way up to the top. In doing this I would take regular short breaks (maximum 1 minute) every 5 minutes. If I do not achieve my Pyramid that day, then that is ok. It’s either too hard for me, or I’m just having a bad day. Give yourself a time limit. If your Pyramid isn’t complete in say 30 minutes, then admit defeat and try again tomorrow. This is the first in a series of “How To” blog posts intended to help you develop your skills outside of our classes. These posts are intended to support our students in practising their skills between classes. Although they are not written for non-students (“civilians”?) they may be helpful; but there is no substitute for proper teaching – even with a relatively safe discipline like juggling, and especially with any higher-risk activity like acrobatics. A quick search on Google for “how to handstand” returns about 8,160,000 results. So why am I writing a how to practice handstands at home post? And why is it the first in this series? Because a lot of the stuff on the internet gives poor technique, assumes a certain level of competence or assumes a certain age of the participant. I wanted to write something that was intended to help our students and their parents – not the entire internet – and presented good technique. I’ve mostly used videos by GymnasticsWOD who present very good technique. Thanks, Carl. And aside from it being an important skill (it’s an essential building block of cartwheels, round offs, handsprings, back flips and more) it’s first because I decided to write this one first. Here’s what various handstands look like. You can see in the first handstand position the legs and arms are bent, the head is stuck out, the back is arched, and the legs are apart with feet flexed. This is bad. The second part shows a classic old-school handstand shape. The legs are together and tight, toes are pointing, arms are locked out straight but the head is still sticking out and the back is still arched. The shoulders, neck and back are being over-worked. This is better than before but still not good. Unfortunately it’s often the best people can manage with poor shoulder flexibility as the back has to compensate for a poor shoulder angle by arching. The third shape is what we’re looking for. This is a good handstand. The whole body is in line. feet over knees, knees over hips, hips over shoulders, shoulders over elbows, elbows over hands. Notice how the shoulder angle is now opened to 180° and the back is no longer arched. This is efficient and effective, and is what we are aiming for: straight and tight. There are basically three factors that impact your ability to handstand. Developing each of these three aspects will enable you to be confident performing a handstand. Here are six exercises that you can do to practice your handstands at home. Doing the following exercises – with good technique – will improve your handstands. But if you do them with poor technique you either won’t improve, or won’t improve as fast as you could. It’s almost always better to practice for a shorter time with better technique than it is to sacrifice good technique just to hold on for a few seconds more. If you find yourself unable to maintain good position: stop, rest for a few seconds and start again properly. Strengthening your core will massively improve your handstands. Practice holding dish position for ever increasing times. Start at 20 – 30 seconds and build from there in 10-15 second intervals. Obviously, if you’re strong start with a longer hold. Remember: in dish you want to keep your back flat against the ground. Have someone try to slide their hand under your lower back to check if you’re in a good position. If you can hold dish, try to rock without losing your body shape. The body tension this develops is critical for maintaining your position in handstand while focusing on balancing at the same time. Note: American’s call dish “hollow”. You should also try this with arch position. With the exception of the shoulder angle, this shape is essentially the same as a good handstand shape. It helps develop static strength, stamina, body awareness and a good line. In front support the lower back should be flat, with the pelvis tucked in; the chest should be in with the upper back slightly rounded; legs should together and the glutes (bum muscles) should be squeezed; and the head should be in the natural line with the spine (ie. not lifted or dropped). Start with holding front support for 20-30 seconds and then increase it by 10-15 seconds. You should be able to hold it comfortably for at least 1 minute. You can also try raising your feet and putting them on something like a chair. Here’s a good video that demonstrates good technique in front support, and how to progress it towards a handstand. Skip to 4:46 to get to the front support position but you’ll miss the good stuff about shoulder position for handstands. Doing a handstand against the wall is a tried and tested method of developing your handstands – even at advanced levels. But you have to handstand with your chest facing the wall . If you have your back to the wall you’ll arch your back. Facing the wall let’s you keep good lines. It may seem too easy but it works – handstands against a wall let you concentrate on your body shapes and lines while taking away the need to concentrate on balance. It also helps develop your strength and stamina. You can also do this at an angle with your hands a bit further away from the wall, this is easier but make sure you keep the body straight and tight! As you get stronger you can slowly move your hands closer to the wall, creating a steeper body angle, eventually ending up completely vertical. As with the front support holds, aim for 20-30 seconds building up to at least 1 minute. Good hand balancers will be able to stay on their hands for at least 5 minutes. Once you are able to stay in handstand comfortably for 1 minute, gently try to push off of the wall, pushing your weight into your finger tips to balance. These may seem simple but a good bunny hop is hard to do. Make sure you have your fingers spread, hands shoulder width apart, elbows locked out, head in a neutral position and feet & knees together. Start with some small bunny hops, pushing weight into your hands as you go. As they get bigger you’ll need someone to support you so you can stay on your hands in tuck. Have your parent/friend stand so that they can support your shoulders and hips as you tuck up into a tucked handstand position. As you improve and get more confident, you’ll be able to extend your legs into a proper handstand. If you’ve practiced everything up to this point you should be ready to start kicking up into handstand. Make sure you start standing in a straight, stretched position, take a long lunge forward, reach your hands away from you and do a small kick up, letting your feet come slightly off the floor. See if you can get the kick up to be slightly bigger each time until you start to feel that you are balancing on your hands for a moment. Make sure you keep your legs in split so that the weight of your legs stops you tipping over the top. Once you can reach the balance point you can try swapping your legs. This helps you to practice balancing and bringing your feet together while still reducing the risk of tipping too far over. Make sure you’re maintaining your straight position the whole way through the movement and are returning to your straight, stretched starting position to finish. As you improve you can try to hold the balance, maintaining a small split, and slowly bringing your feet together. Trying to kick up and bring your feet together fast is a sure-fire way to lose your balance as not only does your kick up have to be precise but the second leg has a tendency to make you overshoot. How often should I practice handstands at home? 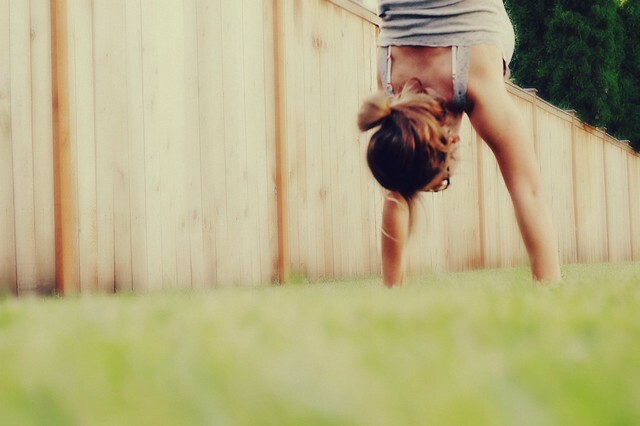 Practice your handstands at home as often as you like. The more practice you do the stronger and better you’ll become and the more fun handstands will be. Don’t practice when you’re over-tired or if your wrists are hurting. You want to push yourself but not damage yourself. I learnt to juggle when I was about 10. 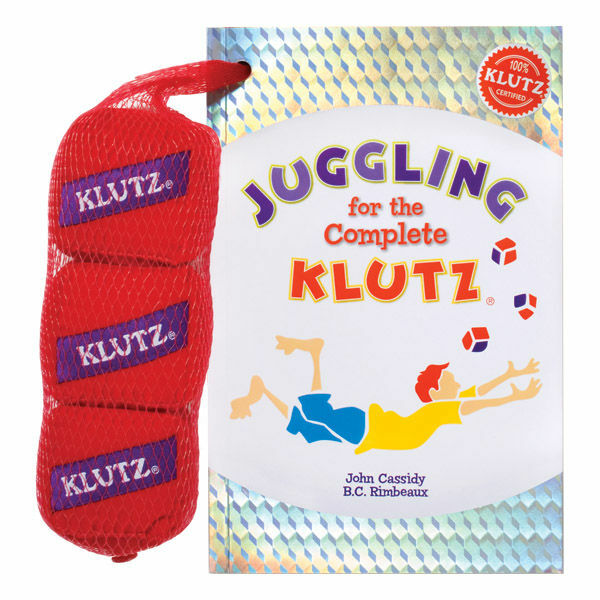 I was home ill for a week and my dad had the classic juggling book Juggling for the Complete Klutz so I taught myself to juggle. It took me most of the week with a bit of practice each day to really get it solid. I’d tried once before when I was 6 or 8 years old but I think I was just too young at that point to really be able to get it. Anyway, with a week of practice under my belt I was a juggler. I went back to school and started teaching the other kids in my class how to juggle. I’ve got vivid memories of standing in the hallway outside our class 6 classroom teaching two or three people how to juggle. But they couldn’t get it and didn’t seem to have the patience to learn. I’m sure that I, at 10 years old, didn’t really have the knowledge of how to teach them either. Twenty years later I think I’ve now mastered the art of teaching someone to juggle. After 20 years as a juggler, and over a decade as a professional teacher, I’m pretty confident in saying that anyone can juggle 3 balls. I’ve taught thousands of people to juggle over the years and in around 80% of cases I can teach you to juggle in 45 minutes. Some a little longer, some a little quicker. I’ve had people pick it up instantly and I’ve had people who can’t quite crack it after an hour and a half. However, it always surprises me how many people come to my juggling workshops and right at the beginning – before I’ve even started teaching them – tell me they can’t juggle. “If you say so” is a fairly standard response. There is only one thing that stops you from being able to juggle. Saying “I can’t juggle”. This is the one and only thing that is going to get in your way. You may think your mal-coordinated, or think you have bad hand-to-eye coordination but the truth is probably more like you haven’t ever spent much time practising catching. I come from a very sporty family. From a very early age – literally from as soon as I could walk – my dad and grandpa were teaching me to catch. Then it was constant hand-eye coordination games: football, tennis, table tennis, baseball, cricket, etc. It was constant and it was fun. I practised. By the time I taught myself to juggle I’d amassed a huge number of hours practising hand-eye coordination. I guess a lot of people don’t get that. I’ve done a lot of work coaching, both in personal and professional settings, and I coach from an ontological perspective. When I teach juggling, I teach in much the same way. If who you are is that you cannot juggle then you’ll be right. I don’t mean to say that you should be telling yourself “I can juggle” as that kind of affirmation very rarely helps. Instead, confront (stand and face) the simple reality of the situation: you’ve never learnt to juggle. That’s it. You never learned to juggle. It’s a good job you came to my workshop because I know how to teach you to juggle. How do I keep all the balls in the air? That’s probably the most common question I get about learning to juggle. And the simple answer is: You don’t. People often think that you have all three balls in the air but for the most part, you only have one ball in the air. You only have one thing to deal with at a time. And we can all handle dealing with one thing. Juggling is very simple. It’s one action repeated over and over, first on the right, then on the left. Right, left, right, left, right, left. Driving a car is far more complicated. You have to carefully and precisely coordinate a steering wheel, gears, three pedals, mirrors, indicators, wipers, lights as well as all the other vehicles on the road, pedestrians, animals (even a circus Zebra recently!) and concentrate on where you’re going! You can drive but you think you can’t juggle? People have no problem spending weeks, months or even years learning to drive. They expect driving to be difficult and have no issue persevering with learning. However, there is a clear pay-off in being able to drive. There isn’t often a clear pay-off in being able to juggle. So there has to be something else. You have to create for yourself a desire to be able to juggle. You’ve got to want it. If you don’t want to be able to juggle, learning will just be a chore. And if it ain’t no fun for you, it just ain’t worth it. People think that in juggling catching is really important. One of the hardest things to get people to accept is dropping. People think that if they drop, it means they can’t catch, it means they aren’t any good at it. People get embarrassed when they drop, they wonder what other people think of them when they drop. And sometimes they’re so afraid of dropping that they’d rather not try to learn. And dropping really isn’t a big deal. Dropping certainly doesn’t mean you can’t juggle. Juggling has been around for thousands of years (since almost 2000 BC). There isn’t a juggler in the world that hasn’t dropped. 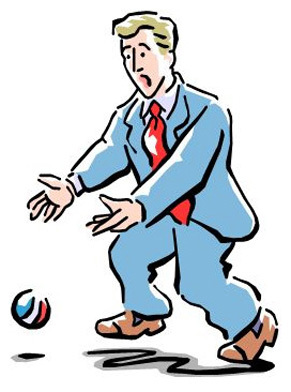 But people are so fixated on not dropping that they forget the most important part of juggling: a good throw. If you do a good throw a catch is easy. If you do a bad throw a catch is difficult. Jugglers are concerned with throws not catches. If you can do good throw, after good throw, after good throw, your body will take care of the catches on it’s own. Then you can learn to juggle.